Just guessing, but if you’re reading this, I’m willing to bet you want to use SparkPost and you probably develop in PHP. In this article, I’m going to go through some basic code so that you can get up and running using PHP and SparkPost. The good news is we have a client library to help you out. It does have a few pre-requisites, but we’ve tried to design the library to be as flexible as possible. Some sort of request library. This can be cURL or some other library like Guzzle. The SparkPost client library is hosted on packagist.org and can be installed using composer. If you’ve never used composer, check out their getting started page. Cool. Now that that is taken care of, we should be good to go and can start using SparkPost in code. Just like using any other composer package, the first step is to require the autoloader and then we can use the SparkPost class. Now, like I said above in the requirements you have to have some sort of request library or utility available. This can be cURL or something more like Guzzle. Its really up to you and what is available in your environment. SparkPost currently implements the egeloen/ivory-http-adapter and you can see all of the supported request adapters on their github page. (See sidenote below). You’ll have to implement one of these adapters and pass it into the SparkPost constructor. The second argument is your SparkPost API key. This library is currently deprecated in favor of php-http/httplug library. We use Ivory internally to make it simple for you to use whatever HTTP library you want. We do plan to move to the new library in version 2 of the SparkPost PHP Library. Now that everything is setup, sending your first email is easy. The function you need to know is transmission->send and it takes an associative array with a configuration of the email that you want to send. Some of the more important properties of the config are from, html, text, subject, and recipients, but a full list can be found on the SparkPost PHP Library’s GitHub page. 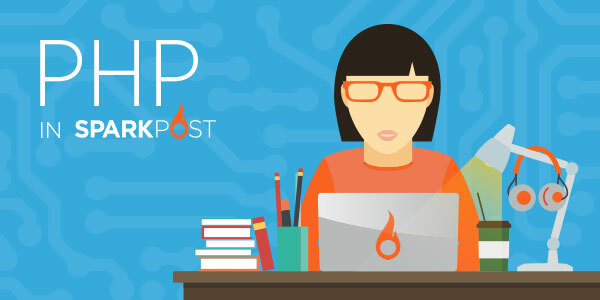 If there are any issues performing any operation, the SparkPost library will throw an exception. So in practice, it is a good idea to wrap this send statement in a try-catch block to handle the error properly. In the code above, the ‘setupUnwrapped’ function creates a helper for the metrics API and adds it to the ‘$sparky’ instance as a property. This new property has four main functions: get, create, update, and delete. You can use these functions to access our REST API endpoints which determined by the first parameter. The second parameter is either an array that maps to a query string like the example above, or an array that gets json encoded as the post body depending on which method you choose. ‘$results’ will contain the API response. The good news is that this method works even if we choose to add support for the same endpoint in the future. So you don’t have to worry about breaking code when you update. Since this method of “build your own helper” relies on directly utilizing the our REST APIs, you should familiarize yourself with our API documentation when using it. For more information please checkout the SparkPost PHP Library on GitHub, our developer hub, or come talk to our team in our community Slack. How do you send to an array of recipients? using an array or object? If you hop over to our community slack channel, our team can help you fairly quickly! If you head over to our community slack channel, someone well-versed in PHP should be able to help out! how can I send an email to the whole list? Manager of Software Engineering - Analytics, Robert Wenner, shares his tips and tricks for avoiding distractions while coding. Learn how to incorporate View In Browser, a link found at the top of emails that opens up the email in a browser, into emails sent via SparkPost. Learn about how SparkPost has standardized the process for replacing database backends in high throughput, zero-downtime production environments.